Today I made Zucchini Christmas Jam. Yep, jam with zucchini in it. It’s a simple recipe I came across by accident on Pinterest. It sounded good so I decided to give it a try using the last giant zucchini from the garden. Truth be told I’m not overly fond of zucchini. I’ll eat it, but it’s not something I’d buy at the grocery store to have year round. It’s so easy to grow and it’s plentiful, but it’s not a taste that I crave at all. I never eat it unless it comes each summer from the garden. Sure, I like zucchini bread. And zucchini in a nice vegetable beef stew is good. Or it’s nice on a fresh salad. Or grilled. Or with pasta sauce. But you quickly run out of ways to eat it and you still have so much of it. 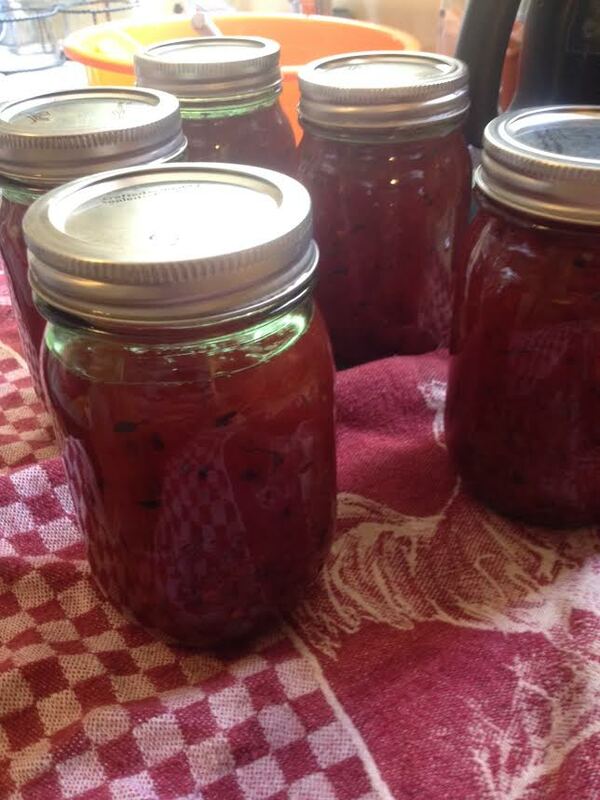 A few years ago we canned zucchini relish, but my sweet tooth wanted to try this jam recipe this year. Stir the zucchini and sugar and bring to a slow boil. Remove from heat and stir in the remaining ingredients. Slowly bring back up to a boil. Pour into jars and process. This yielded 5 jars for me, but you’d probably get more if you used smaller jars. Also, the original recipe did not use pectin, so it just depends on how thick you want your jam to set up. I wish now that I had more zucchini so I could make another 5 jars to give away as Christmas gifts. Anybody got some extra zucchini out there?